Hey everyone, welcome to the Illuminae Blog tour. I've been hearing lots of great things about this book and its exciting format, and I'm sure you have, too! If you're wondering what all the hype is about, then here's the chance to find out--I'm giving away a copy of the book to a lucky blog reader (thanks to the generosity of Random House!). The year is 2575, and two rival megacorporations are at war over a planet that’s little more than an ice-covered speck at the edge of the universe. Too bad nobody thought to warn the people living on it. With enemy fire raining down on them, Kady and Ezra—who are barely even talking to each other—are forced to fight their way onto one of the evacuating fleet, with an enemy warship in hot pursuit. But pursuit by battleship is the least of their worries. Their fleet’s artificial intelligence—which should be protecting them—may actually be an enemy. And a plague is slowly ravaging the fleet with terrifying consequences. As Kady plunges into a web of data hacking in search of the truth, she realizes that there’s only one boy who can help her bring everything to light . . . and of course, it’s her ex-boyfriend, Ezra. 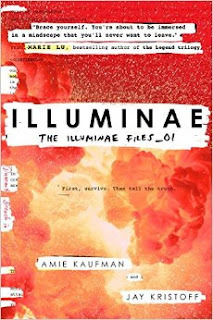 Told through a fascinating dossier of hacked documents—including emails, schematics, military files, IMs, medical reports, interviews, and more—ILLUMINAE is a ground-breaking, edge-of-your-seat thrill ride that will draw teen and adult readers of James Dashner, Rick Yancey, and Veronica Roth yet stands on its own with Kaufman and Kristoff’s unique storytelling. That sounds amazing, right? It also sounds like something that might fill the Battlestar Galatica void in my life. 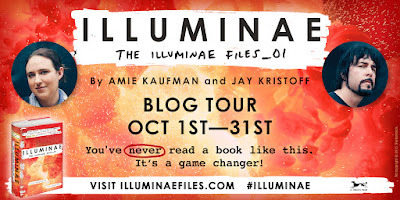 The book is out on October 20th! In the meantime...enter away!